Treatment is typically with antibiotics taken by mouth, such as cephalexin, amoxicillin or cloxacillin. For those who are seriously allergic to penicillin, erythromycin or clindamycin may be used. When methicillin-resistant S. aureus (MRSA) is a concern, doxycycline or trimethoprim/sulfamethoxazole may, in addition, be recommended. Concern is related to the presence of pus or previous MRSA infections. Elevating the infected area may be useful, as may pain killers. Potential complications include abscess formation. Around 95% of people are better after seven to ten days of treatment. Those with diabetes, however, often have worse outcomes. Cellulitis occurred in about 21.2 million people in 2015. In the United States about two of every 1,000 people per year have a case affecting the lower leg. Cellulitis in 2015 resulted in about 16,900 deaths worldwide. In the United Kingdom, cellulitis was the reason for 1.6% of admissions to a hospital. Cellulitis following an abrasion: Note the red streaking up the arm from involvement of the lymphatic system. Potential complications may include abscess formation, fasciitis, and sepsis. About 80% of cases of Ludwig's angina, or cellulitis of the submandibular space, are caused by dental infections. Mixed infections, due to both aerobes and anaerobes, are commonly associated with this type of cellulitis. Typically, this includes alpha-hemolytic streptococci, staphylococci, and bacteroides groups. Predisposing conditions for cellulitis include insect or spider bite, blistering, animal bite, tattoos, pruritic (itchy) skin rash, recent surgery, athlete's foot, dry skin, eczema, injecting drugs (especially subcutaneous or intramuscular injection or where an attempted intravenous injection "misses" or blows the vein), pregnancy, diabetes, and obesity, which can affect circulation, as well as burns and boils, though debate exists as to whether minor foot lesions contribute. Occurrences of cellulitis may also be associated with the rare condition hidradenitis suppurativa or dissecting cellulitis. The appearance of the skin assists a doctor in determining a diagnosis. A doctor may also suggest blood tests, a wound culture, or other tests to help rule out a blood clot deep in the veins of the legs. Cellulitis in the lower leg is characterized by signs and symptoms similar to those of a deep vein thrombosis, such as warmth, pain, and swelling (inflammation). The elderly and those with a weakened immune system are especially vulnerable to contracting cellulitis. Diabetics are more susceptible to cellulitis than the general population because of impairment of the immune system; they are especially prone to cellulitis in the feet, because the disease causes impairment of blood circulation in the legs, leading to diabetic foot or foot ulcers. Poor control of blood glucose levels allows bacteria to grow more rapidly in the affected tissue, and facilitates rapid progression if the infection enters the bloodstream. Neural degeneration in diabetes means these ulcers may not be painful, thus often become infected. Those who have suffered poliomyelitis are also prone because of circulatory problems, especially in the legs. Cellulitis is also common among dense populations sharing hygiene facilities and common living quarters, such as military installations, college dormitories, nursing homes, oil platforms, and homeless shelters. Cellulitis is most often a clinical diagnosis, readily identified in many people by history and physical examination alone, with rapidly spreading areas of cutaneous swelling, redness, and heat, occasionally associated with inflammation of regional lymph nodes. While classically distinguished as a separate entity from erysipelas by spreading more deeply to involve the subcutaneous tissues, many clinicians may classify erysipelas as cellulitis. Both are often treated similarly, but cellulitis associated with furuncles, carbuncles, or abscesses is usually caused by S. aureus, which may affect treatment decisions, especially antibiotic selection. Skin aspiration of nonpurulent cellulitis, usually caused by streptococcal organisms, is rarely helpful for diagnosis, and blood cultures are positive in fewer than 5% of all cases. It is important to evaluate for co-existent abscess, as this finding usually requires surgical drainage as opposed to antibiotic therapy alone. Physicians' clinical assessment for abscess may be limited, especially in cases with extensive overlying induration, but use of bedside ultrasonography performed by an experienced practitioner readily discriminates between abscess and cellulitis and may change management in up to 56% of cases. Use of ultrasound for abscess identification may also be indicated in cases of antibiotic failure. Cellulitis has a characteristic "cobblestoned" appearance indicative of subcutaneous edema without a defined hypoechoic, heterogeneous fluid collection that would indicate abscess. 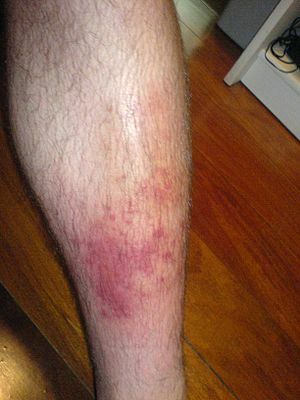 Other conditions that may mimic cellulitis include deep vein thrombosis, which can be diagnosed with a compression leg ultrasound, and stasis dermatitis, which is inflammation of the skin from poor blood flow. Signs of a more severe infection such as necrotizing fasciitis or gas gangrene that would require prompt surgical intervention include purple bullae, skin sloughing, subcutaneous edema, and systemic toxicity. Misdiagnosis can occur in up to 30% of people with suspected lower-extremity cellulitis, leading to 50,000 to 130,000 unnecessary hospitalization and $195 to $515 million in avoidable healthcare spending annually in the United States. Associated musculoskeletal findings are sometimes reported. When it occurs with acne conglobata, hidradenitis suppurativa, and pilonidal cysts, the syndrome is referred to as the follicular occlusion triad or tetrad. Lyme disease can be misdiagnosed as cellulitis. The characteristic bullseye rash does not always appear in Lyme disease (the rash may not have a central or ring-like clearing, or not appear at all). Factors supportive of Lyme include recent outdoor activities where Lyme is common and rash at an unusual site for cellulitis, such as armpit, groin, or behind the knee. Lyme can also result in long-term neurologic complications. The standard treatment for cellulitis, cephalexin, is not useful in Lyme disease. When it is unclear which one is present, the IDSA recommends treatment with cefuroxime axetil or amoxicillin/clavulanic acid, as these are effective against both infections. In those who have previously had cellulitis, the use of antibiotics may help prevent future episodes. This is recommended by CREST for those who have had more than two episodes. A 2017 meta-analysis found a benefit of preventative antibiotics for recurrent cellulitis in the lower limbs, but the preventative effects appear to diminish after stopping antibiotic therapy. Antibiotics are usually prescribed, with the agent selected based on suspected organism and presence or absence of purulence, although the best treatment choice is unclear. If an abscess is also present, surgical drainage is usually indicated, with antibiotics often prescribed for co-existent cellulitis, especially if extensive. Pain relief is also often prescribed, but excessive pain should always be investigated, as it is a symptom of necrotizing fasciitis. Elevation of the affected area is often recommended. Steroids may speed recovery in those on antibiotics. Antibiotics choices depend on regional availability, but a penicillinase-resistant semisynthetic penicillin or a first-generation cephalosporin is currently recommended for cellulitis without abscess. A course of antibiotics is not effective in between 6 and 37% of cases. Cellulitis in 2015 resulted in about 16,900 deaths worldwide, up from 12,600 in 2005. Horses may acquire cellulitis, usually secondarily to a wound (which can be extremely small and superficial) or to a deep-tissue infection, such as an abscess or infected bone, tendon sheath or joint. Cellulitis from a superficial wound usually creates less lameness (grade 1–2 of 5) than that caused by septic arthritis (grade 4–5). The horse exhibits inflammatory edema, which is hot, painful swelling. This swelling differs from stocking up in that the horse does not display symmetrical swelling in two or four legs, but in only one leg. This swelling begins near the source of infection, but eventually continues down the leg. In some cases, the swelling also travels distally. Treatment includes cleaning the wound and caring for it properly, the administration of NSAIDs, such as phenylbutazone, cold hosing, applying a sweat wrap or a poultice, and mild exercise. Veterinarians may also prescribe antibiotics. Cellulitis is also seen in staphylococcal and corynebacterial mixed infections in bulls. ^ a b c d e f g h i j k l m n o p q r s t u v w x y z aa Vary, JC; O'Connor, KM (May 2014). "Common Dermatologic Conditions". Medical Clinics of North America. 98 (3): 445–85. doi:10.1016/j.mcna.2014.01.005. PMID 24758956. ^ a b c d e Mistry, RD (Oct 2013). "Skin and soft tissue infections". Pediatric Clinics of North America. 60 (5): 1063–82. doi:10.1016/j.pcl.2013.06.011. PMID 24093896. ^ a b c d e Tintinalli, Judith E. (2010). Emergency Medicine: A Comprehensive Study Guide (Emergency Medicine (Tintinalli)) (7th ed.). New York: McGraw-Hill Companies. p. 1016. ISBN 978-0-07-148480-0. ^ a b c Wormser GP, Dattwyler RJ, Shapiro ED, Halperin JJ, Steere AC, Klempner MS, Krause PJ, Bakken JS, Strle F, Stanek G, Bockenstedt L, Fish D, Dumler JS, Nadelman RB (1 November 2006). "The Clinical Assessment, Treatment, and Prevention of Lyme Disease, Human Granulocytic Anaplasmosis, and Babesiosis: Clinical Practice Guidelines by the Infectious Diseases Society of America". Clinical Infectious Diseases. 43 (9): 1089–1134. doi:10.1086/508667. ^ a b c d e f Phoenix, G; Das, S; Joshi, M (Aug 7, 2012). "Diagnosis and management of cellulitis". BMJ. Clinical Research. 345: e4955. doi:10.1136/bmj.e4955. PMID 22872711. ^ a b GBD 2015 Disease and Injury Incidence and Prevalence, Collaborators (8 October 2016). "Global, regional, and national incidence, prevalence, and years lived with disability for 310 diseases and injuries, 1990-2015: a systematic analysis for the Global Burden of Disease Study 2015". Lancet. 388 (10053): 1545–1602. doi:10.1016/S0140-6736(16)31678-6. PMC 5055577. PMID 27733282. ^ a b c GBD 2015 Mortality and Causes of Death, Collaborators (8 October 2016). "Global, regional, and national life expectancy, all-cause mortality, and cause-specific mortality for 249 causes of death, 1980-2015: a systematic analysis for the Global Burden of Disease Study 2015". Lancet. 388 (10053): 1459–1544. doi:10.1016/S0140-6736(16)31012-1. PMC 5388903. PMID 27733281. ^ Dryden, M (Sep 2015). "Pathophysiology and burden of infection in patients with diabetes mellitus and peripheral vascular disease: focus on skin and soft-tissue infections". Clinical Microbiology and Infection. 21: S27–S32. doi:10.1016/j.cmi.2015.03.024. PMID 26198368. ^ Rook's textbook of dermatology (9 ed.). Wiley-Blackwell. 2016. p. 26.18. ISBN 9781118441190. ^ Dhingra, PL; Dhingra, Shruti (2010) . Nasim, Shabina (ed.). Diseases of Ear, Nose and Throat. Dhingra, Deeksha (5th ed.). New Delhi: Elsevier. pp. 277–78. ISBN 978-81-312-2364-2. ^ a b c d e Stevens, Dennis L.; Bisno, Alan L.; Chambers, Henry F.; Dellinger, E. Patchen; Goldstein, Ellie J. C.; Gorbach, Sherwood L.; Hirschmann, Jan V.; Kaplan, Sheldon L.; Montoya, Jose G. (2014-06-18). "Practice Guidelines for the Diagnosis and Management of Skin and Soft Tissue Infections: 2014 Update by the Infectious Diseases Society of America". Clinical Infectious Diseases. 59 (2): 147–59. doi:10.1093/cid/ciu296. ISSN 1058-4838. PMID 24947530. Archived from the original on 2015-01-31. ^ a b Singer, Adam J.; Talan, David A. (2014-03-13). "Management of Skin Abscesses in the Era of Methicillin-Resistant Staphylococcus aureus". New England Journal of Medicine. 370 (11): 1039–1047. doi:10.1056/NEJMra1212788. ISSN 0028-4793. PMID 24620867. ^ Bornemann, Paul; Rao, Victor; Hoppmann, Richard (2015-05-04). "Ambulatory Ultrasound". In Mayeaux, E.J. (ed.). The Essential Guide to Primary Care Procedures. Lippincott Williams & Wilkins. ISBN 9781496318718. Archived from the original on 2016-05-06. ^ Weng, Qing Yu; Raff, Adam B.; Cohen, Jeffrey M.; Gunasekera, Nicole; Okhovat, Jean-Phillip; Vedak, Priyanka; Joyce, Cara; Kroshinsky, Daniela; Mostaghimi, Arash (2017). "Costs and Consequences Associated With Misdiagnosed Lower Extremity Cellulitis". JAMA Dermatology. 153 (2): 141. doi:10.1001/jamadermatol.2016.3816. PMID 27806170. Archived from the original on 2016-11-04. ^ Scheinfeld NS (February 2003). "A case of dissecting cellulitis and a review of the literature". Dermatology Online Journal. 9 (1): 8. PMID 12639466. Archived from the original on 2012-04-14. ^ a b Wright WF, Riedel DJ, Talwani R, Gilliam BL (June 2012). "Diagnosis and management of Lyme disease". American Family Physician. 85 (11): 1086–93. PMID 22962880. Archived from the original on 27 September 2013. ^ "Lyme Disease Data and surveillance". Lyme Disease. Centers for Disease Control and Prevention. Retrieved April 12, 2019. ^ Aucott JN (June 2015). "Posttreatment Lyme disease syndrome". Infectious Disease Clinics of North America. 29 (2): 309–323. doi:10.1016/j.idc.2015.02.012. PMID 25999226. ^ Oh, CC; Ko, HC; Lee, HY; Safdar, N; Maki, DG; Chlebicki, MP (Feb 24, 2014). "Antibiotic prophylaxis for preventing recurrent cellulitis: A systematic review and meta-analysis". Journal of Infection. 69 (1): 26–34. doi:10.1016/j.jinf.2014.02.011. PMID 24576824. ^ Dalal, Adam; Eskin-Schwartz, Marina; Mimouni, Daniel; Ray, Sujoy; Days, Walford; Hodak, Emmilia; Leibovici, Leonard; Paul, Mical (2017-06-20). "Interventions for the prevention of recurrent erysipelas and cellulitis". Cochrane Database of Systematic Reviews. 6: CD009758. doi:10.1002/14651858.CD009758.pub2. ISSN 1465-1858. PMID 28631307. ^ Kilburn, SA; Featherstone, P; Higgins, B; Brindle, R (16 June 2010). "Interventions for cellulitis and erysipelas". The Cochrane Database of Systematic Reviews (6): CD004299. doi:10.1002/14651858.CD004299.pub2. PMID 20556757. ^ Obaitan, Itegbemie; Dwyer, Richard; Lipworth, Adam D.; Kupper, Thomas S.; Camargo, Carlos A.; Hooper, David C.; Murphy, George F.; Pallin, Daniel J. (May 2016). "Failure of antibiotics in cellulitis trials: a systematic review and meta-analysis". The American Journal of Emergency Medicine. 34 (8): 1645–52. doi:10.1016/j.ajem.2016.05.064. PMID 27344098. ^ Adam EN, Southwood LL (August 2006). "Surgical and traumatic wound infections, cellulitis, and myositis in horses". Veterinary Clinics of North America: Equine Practice. 22 (2): 335–61, viii. doi:10.1016/j.cveq.2006.04.003. PMID 16882479. ^ Fjordbakk CT, Arroyo LG, Hewson J (February 2008). "Retrospective study of the clinical features of limb cellulitis in 63 horses". Veterinary Record. 162 (8): 233–36. doi:10.1136/vr.162.8.233. PMID 18296664. ^ Pathan MM, Khan MA, Bhonsle AV, Bhikane AU, Moregaonkar SD, Kulkarni MB (2012). "Cellulitis in a Red Kandhari Bull: A Case Report". Vetworld. 5 (3): 183–84. doi:10.5455/vetworld.2012.183-184. Archived from the original on 2013-03-16. Stevens, DL; Bisno, AL; Chambers, HF; Dellinger, EP; Goldstein, EJ; Gorbach, SL; Hirschmann, JV; Kaplan, SL; Montoya, JG; Wade, JC (15 July 2014). "Practice guidelines for the diagnosis and management of skin and soft tissue infections: 2014 update by the infectious diseases society of America". Clinical Infectious Diseases. 59 (2): 147–59. doi:10.1093/cid/ciu296. PMID 24947530.